Dante: "We gave it everything"
Munich - A frustrating encounter, but a thoroughly pleasing autumn's work: that was the general consensus among the FC Bayern Munich camp after Friday's 1-1 draw with Borussia Mönchengladbach. It was a curious night at the Allianz Arena. The league leaders made an ominously good start, only to fall behind to Thorben Marx's 21st-minute penalty. Xherdan Shaqiri celebrated his maiden Bundesliga goal as Bayern levelled, but some inspired goalkeeping from Gladbach’s Marc-Andre ter Stegen ultimately denied the Bavarians the celebratory finale they had hoped for. "We actually played really well. It's a shame we didn't get the second goal, but we can leave with our heads held high because we gave it everything to try and get all three points," explained ex-Gladbach defender Dante after the game. "Even at Bayern, sometimes the ball just doesn't want to go in the net." It was only the fourth time Bayern had been denied victory in the league this season, but that will hardly detract from what has so far been a storming campaign for Jupp Heynckes' men. Sitting pretty at the top of the Bundesliga table having accrued a staggering 42 points in 17 outings, it's little wonder there's such a buzz around Bayern as they head into the winter break. "I'm really happy, not because I've played every game [in the league] this season, but because we're top and have opened up a great lead on second and third place," beamed Dante. Indeed, whatever happens elsewhere this weekend, the Bundesliga frontrunners will end 2012 holding at least a nine-point advantage over their rivals. "We can say that we've made a step in the right direction, but the first 17 games are out of the way and there's still the second half of the season to come," continued the unmistakeable defender. "We want to keep our focus and reach our season targets." The only thing which denied Bayern yet another victory was the brilliance of Gladbach No1 ter Stegen. The 20-year-old custodian returned to form in often spectacular style, enjoying more touches than any of his team-mates (62) and pulling off seven exceptional saves. 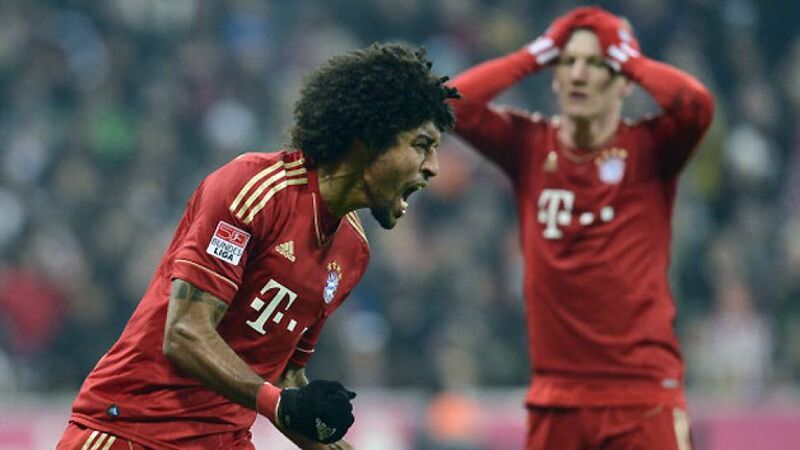 "But for him, Bayern would have won today," said Dante. "I'm pleased for him personally because he didn't make the best start to the season but he played really well here." "It was very emotional to see my ex-colleagues again, but during the game they're just like any other opposition and I was solely focused on helping my team," added Dante, typifying the attitude at the heart of Bayern's trailblazing form and which the record champions will have to conjure up one last time for their final fixture of the calendar year in the DFB Cup against FC Augsburg on Tuesday.